With tender leaves, sold prewashed in bags, baby spinach is one of the easiest dark leafy greens to eat. Dark leafy greens are important in your diet: they have a high phytonutrient content, which gives them anti-inflammatory, anti-cancer and blood-pressure-lowering properties. Spinach is an excellent source of antioxidants and (like other dark leafy greens) is loaded with vitamins A and K, and is an excellent source of several other vitamins and minerals as well as vitamin C, folate, calcium, and iron. One cup of raw spinach has only 7 calories; a cup of cooked spinach has 40 calories, 7 grams of carbohydrate, 4 grams of fiber, and 5 grams of protein. You can find spinach throughout the year in your regular grocery store, although you're likely to get the best deals on fresh spinach from March through October when spinach is in season. Look for dark green leaves without signs of yellowing, wilting, or a slimy coating. If you're into gardening, baby spinach is especially quick and easy to grow, and very economical -- a $1-2 seed packet can provide you with fresh spinach for an entire season. Frozen chopped spinach is handy to keep on hand for when you don't have fresh greens in the house, and is as nutritious (or more so) than fresh, since it's frozen soon after picking. You can use a fine cheese grater to shred frozen spinach into rice and sauces or to top off pizzas. Canned spinach is another option, but be sure to buy no-salt-added. Store fresh spinach in an airtight container in the fridge for up to five days. Wash fresh spinach before you use it. If you're using whole leaf spinach, one way to wash it is to place the leaves in a large bowl of water, swish them around, lift them out and then discard the water. You can repeat this step until the water is clear. If you bought baby spinach or whole leaf spinach in a bag then it will already have had the sand removed and you just need to rinse it off under running water. Swap it for other lettuces in your favorite salad recipes, or make it the star of the salad, as in this Spinach Poppyseed Salad. Add a handful to scrambled eggs or to soup. Cook it up in a bit of oil as a non-starchy side dish to whatever else you're serving. Spinach is high in oxalates, which is a naturally occurring substance found in plants and animals. High concentrations of oxalates can cause them to crystallize. 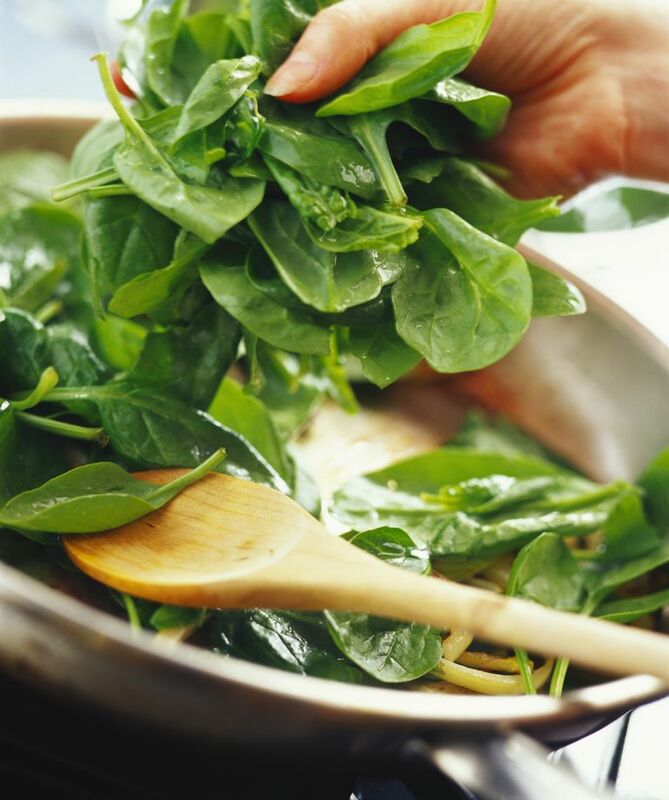 If you have a history of kidney or gallbladder problems you may want to limit the amount of spinach you eat. Oxalates also can interfere with calcium and iron absorption, although less so with the form of iron found in spinach (non-heme iron). Spinach also contains naturally occurring substances called purines. Excess accumulation of purines in the body can lead to excess accumulation of uric acid. In some people, this can lead to a condition known as gout. If you are prone to gout then you should limit your intake of spinach.